Working on wing generator code that computes NACA airfoil sections for a planform that is inserted from an Inkscape tracing. Internal spars & ribs will be parametrically added later. But the first task is to convert the solid polyhedron into a thin 3D printable shell. The thickness needs to be precisely controlled (constant) to be able to fake out the slicer into printing 2-3 perimeters. The wing shown takes 6 seconds to preview as a solid. A minkowski-difference-universe of the wing with a 0.8mm sphere took over three hours to preview. No hope for render with current resolution. Not sure that a hull-difference instead of a polyhedron would work with undercambered airfoils. 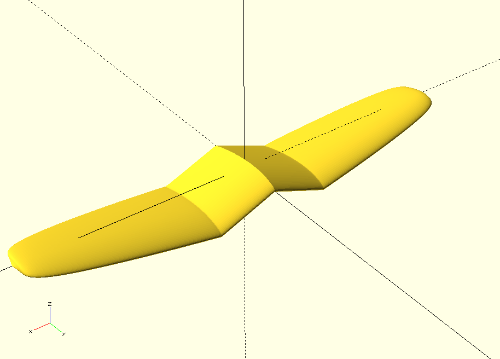 Airfoil polygon sections are computed on the fly and will eventually morph between root and wing tip sections, with some washout added for good measure. These polygons are stitched into the wing polyhedron. 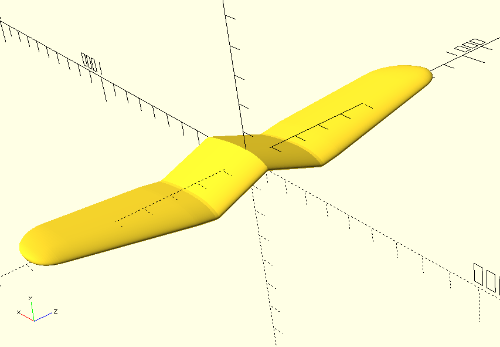 The existing OpenSCAD Offset Transform only generates a new 2-D object, not a polygon, so there is no way to stitch the result back into the interior of the wing polyhedron as a void. A polygon offset function would also be useful for laser cutting curfs and gear mesh tolerances. As a feature request, it would be very useful to have a Polygon Offset function that operates on a 2-D polygon and returns 2-D polygon(s). The engine has to be there already in CGAL with a point/segment representation? Another possibility is to write a hacky offset function in Python that would return a 2-D poly. Does OpenSCAD support user defined Python functions? 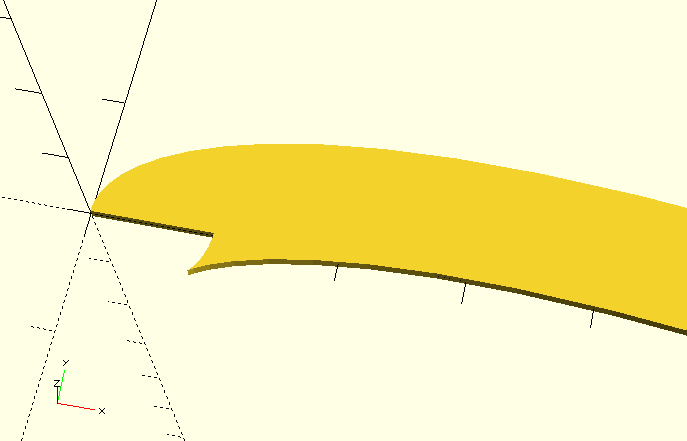 The last resort will be to write a hacky user offset function in OpenSCAD that is tuned for airfoils. At some later point, it would be handy to have a fuselage to go with the wings. Hopefully the solution will be extensible. Reading posts, 3D offset is far off in the future.... Help appreciated. Each row in X describes an airfoil slice shifted in 3D-space. An interpolation scheme is used to construct the in-between slices. Then a sweep() operation is performed to get a half wing. You are right: there is no 'inset' function in OpenSCAD. Either write one, which is quite easy for airfoil data and/or use a work around by either scaling or constructing a core pendant for each slice. Then use a difference() operation over the wing and its core. > engine has to be there already in CGAL with a point/segment representation? the coordinates and return those? Could you post the code for a section of the wing? If you want to create a 3D offset, all you need to do is scale your shape, as I have done in the code attached for an ellipsoid. As I do not have full access to all the vertices of the ellipsoid, this code produces only an approximate 3D offset. But maybe you have access, or maybe you can live with an approximation. As given, the code renders on my system in 13 seconds. I am guessing that I'll need tight control on the wall thicknesses to fake out the slicers and keep a precise perimeter thickness for the outer surface. Part of the problem is that for constant wall thickness, the inner airfoil cut out is not a scaled version of the outer surface. And as the airfoil size changes on a tapered wing, you need a new unique inner cutout for each outer airfoil. @Parkinbot - the splines will come in handy for doing fuselages, but it seems you still have the same problem I was seeing. How do you get the offset inner polygon? I am guessing the minkowski speed is a function of the number of faces and not necessarily the size - Did you try to hollow out your wing? Need to try to dynamically decrease step size where the sections change. How well does your technique deal with airfoil sections containing different numbers of polygon points? For me, stitching together internal airfoil cutouts with differing polygon vertex counts will require some special casing. @Torsten - yes a function returning a polygon vs a transform. Any suggestion for how to code up a convex poly offset function without writing a duplicate of the CGAL routine in native OpenSCAD? Is there a way to call python code from within OpenSCAD? @wolf - not sure that scaling works really well if we're trying to maintain uniform wall thickness. Scaling works ok on an ellipse as in your example, but consider what happens at the pointy trailing edge compared to the leading edge. Not directly, but you can combine command line usage with include<> or use<>, where your python script populates a scad file with variables which you include. BTW, most slicers offer hollow slicing (infill = 0). Did you try this? Didn't promise a general solution, but offered a work around. The inpolation approach uses a skeleton with 6 airfoils. Each one needs to be 'paired' with a core airfoil for difference after sweep(). Thats all. The outer one has to be placed carefully with less distance. Viable, but needs some 'tuning'. Ah, I forgot to answer: I don't see any need for stitching different vertex counts, while doing a sweep(). But if you really want to do it you can use the more general function skin() instead of sweep() - their calls are interchangeable. It was discussed here. Also union() will connect sweeps with different vertex counts. I use this e.g. to implement furcations. How well does your technique deal with airfoil sections containing different numbers of polygon points? For me, stitching together internal airfoil cutouts with differing polygon vertex counts will require some special casing. slicer to do the dirty work. > BTW, most slicers offer hollow slicing (infill = 0). Did you try this? Any suggestion for how to code up a convex poly offset function without writing a duplicate of the CGAL routine in native OpenSCAD? In your case, yes, use differentiation. If you take the unit normal at each point of the airfoil you only need to add a fixed scale of it to the point. If the offset is not too large it will not have self-intersections. Here you have an idea of how to offset non-cambered airfoils. The approach applies also to cambered ones. @zappo said Is there a way to call python code from within OpenSCAD? No, but you can invoke OpenSCAD from Python. Some people use SolidPython for this. a duplicate of the CGAL routine in native OpenSCAD? @Ronaldo "If you take the unit normal at each point of the airfoil you only need to add a fixed scale of it to the point. If the offset is not too large it will not have self-intersections." - I was headed down this path as well, and calculating the derivative directly is interesting. But icky part is that at the wing tips, as the airfoil chord get smaller, the relative thickness of the skin increases relative to the chord, so you have to start playing games reducing the number of points in the airfoil polygon to prevent self-intersections. - but still doable. At some point you just go solid and don't bother with the cut out. @Parkinbot you're right. Slic3r does exactly the function I am looking for because it could create a 3D shell N perimeters thick by using zero infill. And it is fast! I just need a way to merge in the ribbing and spars. Meshmixer can also create shells and export them as STL. It could also merge an STL of the ribbing and spars with the skin. @Doug/MichaelAtOz I need to look at SolidPython or maybe a command line hybrid. Probably pre-compute the entire polyhedron skin in Python or even C.
prevent self-intersections. - but still doable. " My code was just a starting point. You can always clip each internal curve offset against the start-end line instead of doing a overall clipping as I did. This would avoid any self-intersections. solid and don't bother with the cut out. because it could create a 3D shell N perimeters thick by using zero infill. And it is fast! I just need a way to merge in the ribbing and spars. merge an STL of the ribbing and spars with the skin. Ronaldo - I tweaked your example a little bit. I was worried about the polygon folding back on itself and was having trouble visualizing it. At least in this example, the offset function is fairly well behaved, and the direction reversal traces out a convex tip. 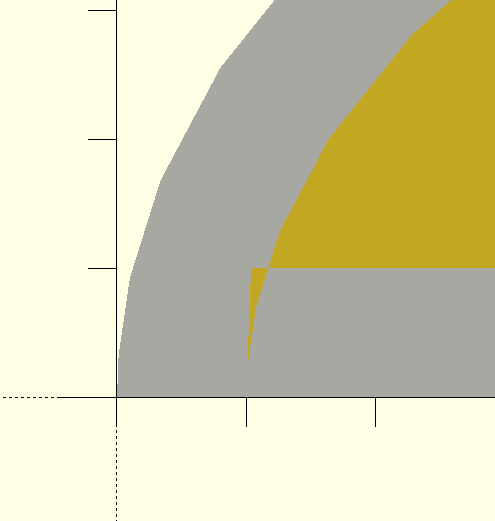 The clipping could obviously be done within the thin_airfoil function itself. Thanks for coding this up. The closed form derivative get more complex when camber is introduced. https://en.wikipedia.org/wiki/NACA_airfoil, so I think the next step is to code it up approximating the derivative with a delta step off the final cambered airfoil function. The straight forward approach would be to calculate the normal for each edge and just add up your inset along this vector to one of the vertices (or even better: to the middle vertex of the edge). 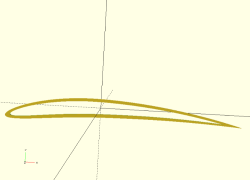 The rest is eliminating self intersection (for inset only), which can get a bit nasty if you go into the details. The 'dirty' one-line approach is to use some procrustes cut from left and right. For outset call inset() with a negative value. I'm curious about this offset function. If the offset is interpreted as an offset to the edges, then the vertices will move by a larger amount and not perpendicular to either segment when the two adjacent edges move, due to the corner. For example, at a right angle, if both edges move by x, then the corner will move diagonally by sqrt(2) * x. Given two such offset equations, the new vertex is the intersection of these two lines which is found by solving the two equations. For the example airfoil below it does produce self-intersections, so I am looking at trying to make a cleanup function for "simple" self-intersections like these. 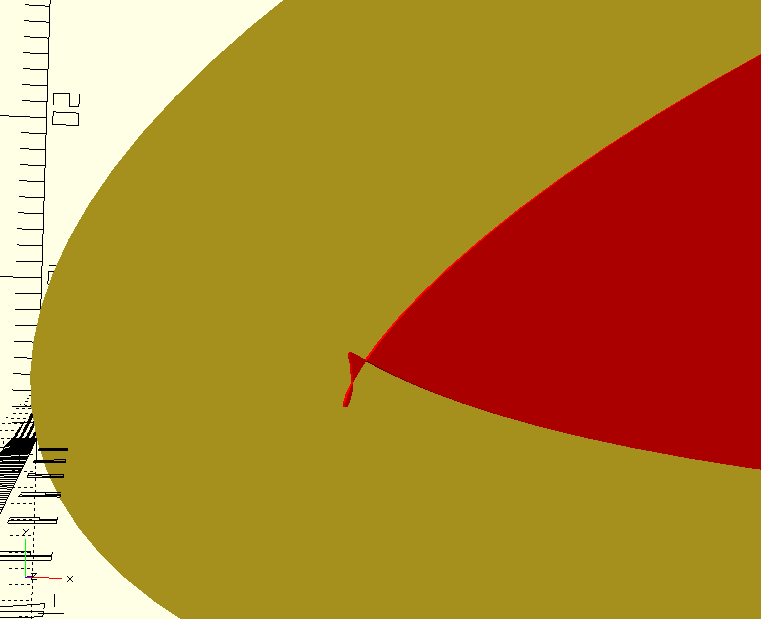 Incidentally, for this airfoil, adjusting each point perpendicular to the line segments produces a rather severe distortion, so I would recommend that approach only be used for 'organic' shapes with many small segments and gentle angles, and avoid using it on geometric shapes with large segments and sharp angles. @Jamie K. I had proposed the use of the curve normal (computed from the curve derivative) for the airfoil because: a) the airfoil curve is differentiable, b) the offset was small and c) the curve was finely discretized. If you have a right angle in the curve it is not differentiable and that approach is not valid. Similarly if the offset is greater then curvature radius of the curve in a convex section, self-intersections will emerge. So, its only valid for offsets small enough. Finally, if the curve discretization is course, the proposed procedure would generate a crude approximation of the offset. It is not by no means a general procedure. Also once you add in the camber equations, the final X and Y points become parametric so the first step is to identify the line segments that intersect. I am thinking to step thru the bottom polyline while doing a lookup on the other polyline for a GT or LT crossing and visa-versa. Once the crossing segments are identified, the intersection point can be calculated as you indicated. The unit normal of the original function, not the polyline, at each vertex should give the bisector between this and the next line segment. There's probably some cleaner geometric ways to calculate the bisector of two adjacent segments not using the function unit normal. I suppose you then create the offset parallelogram and solve for the offset point. But you still have the self intersection problem. Here is a NACA 4312 airfoil with about 200 of polygon points.